I' m happy that you are planning a holiday in Napoli and I' m sure that, the charm of these places kissed by the sky and the sea gives you a unforgettable memory of Naples and Italy in general. But every day, I find a lot of false things written about Naples, sometimes true, many others so exaggerated. For this reason I decided to compile a decalogue with all the things that you need to know before you get close to this great metropolis, the best areas, tricks and tips, which are trivial as you will see common sense, to be used in this as in every city you visit in Italy, Europe and worldwide. All citizens outside the European community need a passport to travel to Italy. At the airport in our country you will have a special visa for a period of 90 days allowing you to reside in our country as tourists, without any problem. 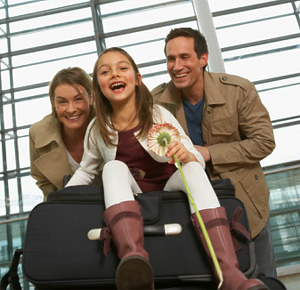 All children traveling abroad must have their own passport. To prevent international child abduction, E.U. governments may require documentary evidence of relationship and permission for the child’s travel from the parent or legal guardian not present. the U.S. State Department website. CDs, tape recorder, binoculars, personal jewelry, portable radio set and 400 cigarettes and a quantity of cigars or pipe tobacco not exceeding 500 grams (1.1 lb.). There are strict limits on importing alcoholic beverages. However, for alcohol bought taxpaid, limits are much more liberal than in other countries of the European Union. Rules governing what you can bring back duty-free vary from country to country and are subject to change, but they’re generally posted on the Web. Anyone caught buying counterfeit products can be fined up to 10,000€, and anyone caught selling counterfeit products could face criminal charges. U.S. Citizens : info at www.cbp.gov or calling U.S. Customs & Border Protection at number: 202/354-1000. Canadian citizens: info at www.cbsa-asfc.gc.ca or calling Canada Border Services Agency at number: 800/461- 9999 in Canada, or 204/983-3500. U.K. citizens : info at www.hmrc.gov.uk or calling HM Revenue & Customs at number: 0845/010-9000 (from outside the U.K., 02920/501-261). +39 081-401338 - fax +39 081-410210. + 39 081-4238-911 - fax +39 081-422-434. The tourist guides that you find in bookstores are frequently limited to advise the warm periods for visiting our city: in this space I'll try to analyze the many factors that only I can know, as a typical Neapolitan, to suggest the right time when to come to Naples. An classical Neapolitan song said: "This is the land of sun, this is the land of the sea"; In the reality the climate here is mild from April to June, very hot in late July and August, loving in September and early November, finally hard throughout the winter. The table below shows the temperatures and millimeters of rainfall recorded throughout the year in Naples. The weather can help to make your vacation more enjoyable, but not more interesting and memorable! To live an event or an occurrence in Napoli is the true value of your vacation! If you can, try to coincide your holiday with one of the following periods of the year, during which the town of Naples and the Campania Region are organizing events with high value, surrounded by stunning natural scenery and exciting. Tips on choose your Accomodations: hotels or b & b? If these my advice will be useful to leave a comment or make a donation on this page!! Thank you very much.